Few days ago, Lego Group presented some new figurines which depicted a father caring for an infant baby, along with the mother in an office outfit. The goal is to “mirror the world we live in today,” Lego says. I came across the news through one of the major Italian newspaper, La Repubblica. 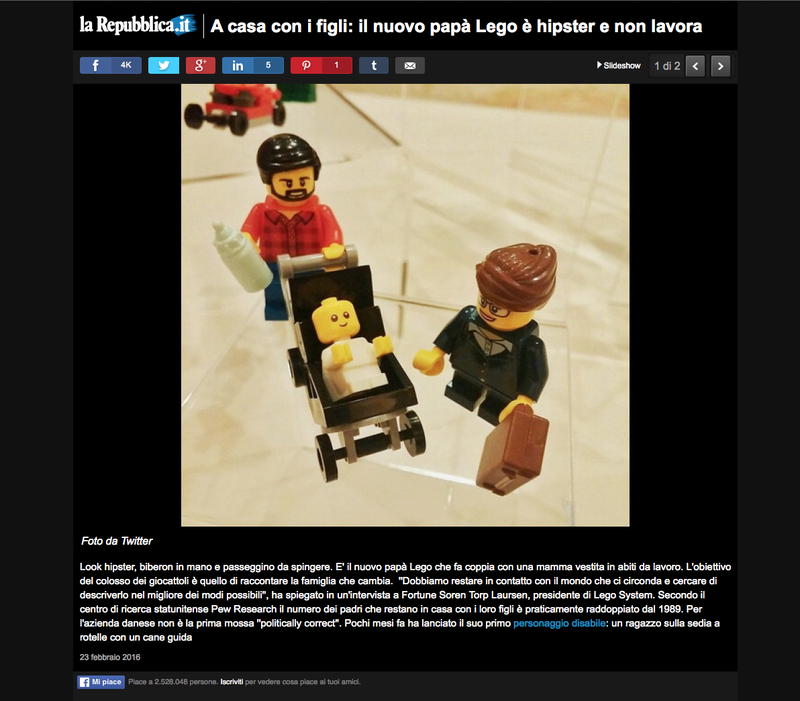 The title, translated from Italian, claimed: "At home with the kids: new Lego dad is hipster and doesn't work". Below, the picture of the figurines. When I read the headline, I felt annoyed, without getting why at first. Was there something in the figurines? Nope, it was the title. The father "doesn't work". That is not the meaning of stay-at-home parent at all. I am sure whoever wrote this entry had the best intentions, in fact I could not find trace of the piece of news on other major Italian newspapers. It didn't make it as a minor article in any other newspaper in Italy, meaning that there's someone at La Repubblica who really cares about showing this small victory towards gender equality. However, words are powerful and can help bias spread out. Here words were chosen unwisely. First of all, daddy is carrying an infant, still drinking from a bottle. This makes it more likely that daddy is taking some time off from work, while mommy chose to go back to work. This is the movement we're trying to start in our civil society. We want fathers to feel parental leave as their right, as a safe and socially acceptable choice. Sure, I also want dads to feel safe choosing to be a stay-at-home parent and make it their full-time job, as well, but this is a choice that today middle-class families rarely can afford to make. Second thought, from my personal experience. 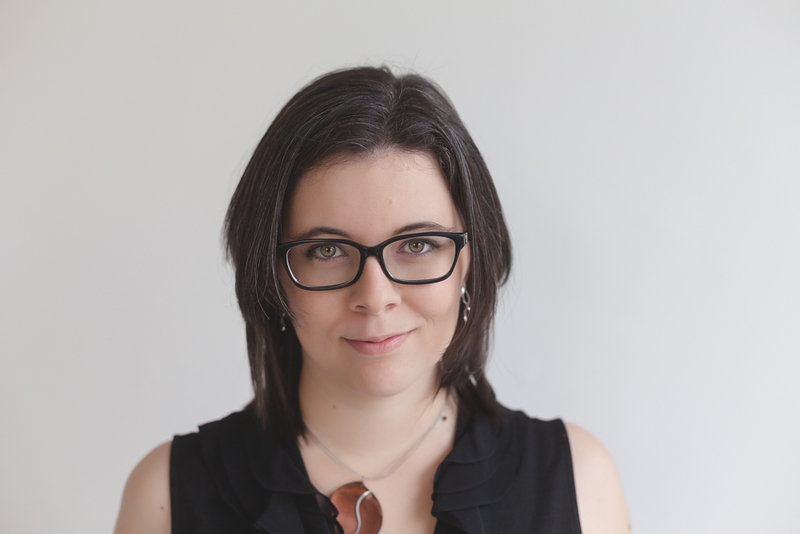 My job and my technical skills are a fundamental part of my identity. I studied and worked a lot to be able to do what I like, I invested and still am investing a big portion of my time. When my daughter was born, I took almost one year off, during which I went to several social meetings with other parents ( 99% mothers). After few months of meeting all these new people at playdates and such, I noticed we never ever asked each other about our professional lives. We were just moms. I love being a mother and my daughter is the most beautiful thing I created (sorry, MatLab scripts), but I am much more than an uterus with legs. Even though this feeling accompanied me for the rest of the parental leave, I tried to be rational and kept repeating myself that I was just overreacting. Until when my husband took his parental leave. People always asked about the job that was waiting for him. There is nothing wrong or bad being a full-time stay-at-home parent, I admire people who are. It's an hard choice and a heavy job made out of love for family. It is also an extreme choice that few people want or can afford to do. This is why parental leave found his way in many countries, not to force people to make the painful choice between work and family, and guarantee infants the best care. Because of pay-gaps, social pressure and even natural conditions (breastfeeding), often mothers feel forced to take all or most of the allowed time-off. 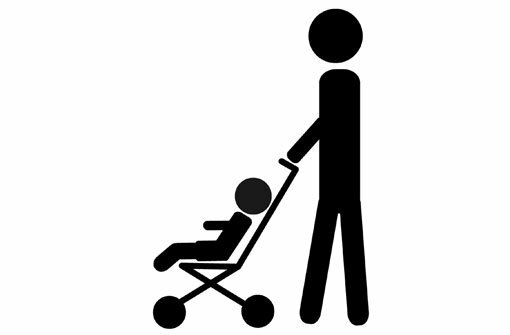 On the other hand, in many countries fathers feel an awful social pressure and do not take their rightful time-off, as it is seen the same as taking a vacation (you are seen as lazy). If an headline like the one above underlines that a stay-at-home dad is not working, there's a strong risk to send a wrong and counterproductive message. Let's stress instead this father is doing a great job taking care of his family.